In my last post, I asked you to add a comment on your favourite quilting holiday, real or imaginary, for the chance to win a pack of Girlfriends at Sea fabrics. Northcott receptionist Jessica randomly selected Glenda from the list of commentors. Now, I personally know Glenda, and the last thing she needs is fabric. 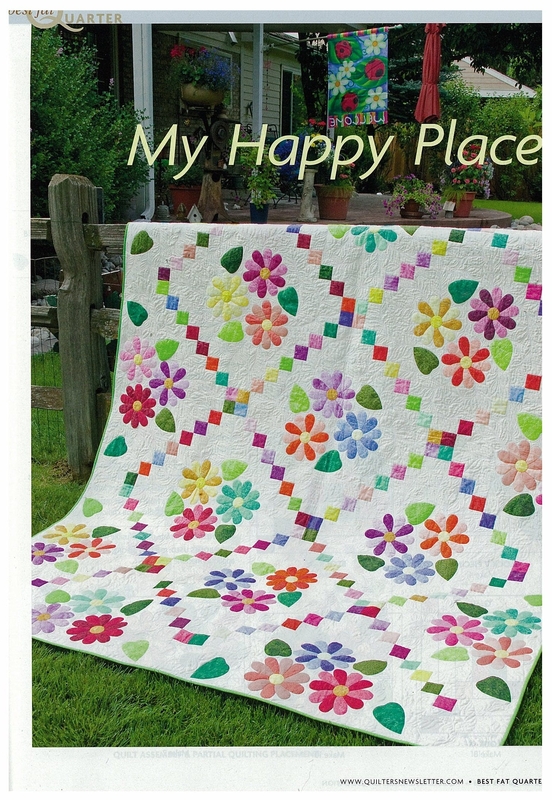 She owns Stone Cottage Crafts quilt shop for heaven’s sake! So, Fellow Quilters, let’s challenge Glenda to make something and send in the picture. Not only is Glenda a shopowner, she is also a pattern designer, and has a couple of patterns in the Northcott line-up. Her Pinwheel Magic pattern uses the Stone Chips (5″ squares of Stonehenge). The way that she makes the pinwheels is brilliant! 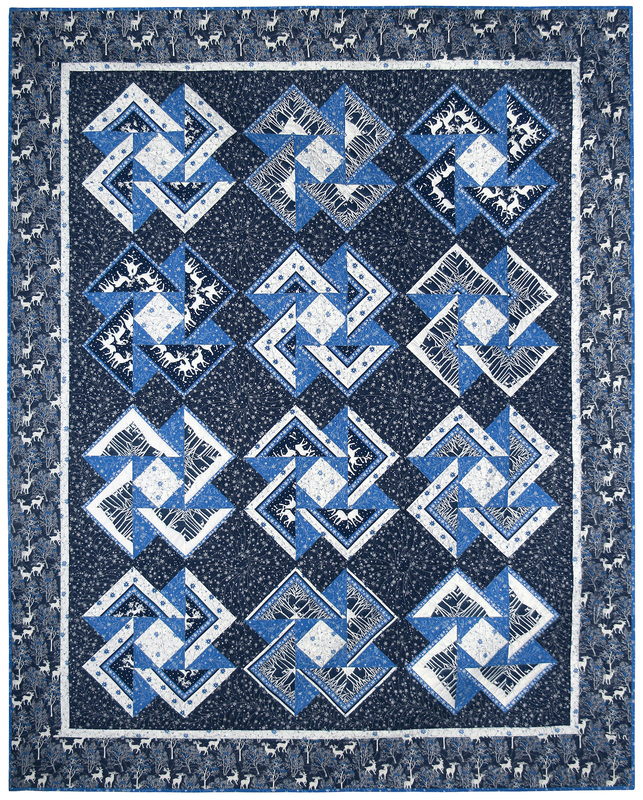 You can see the Pinwheel Magic pattern on Northcott’s website, or ask for it in your favourite (or Glenda’s) quilt shop. September was a very busy month for me. I visited 4 guilds with my trunk show of Interesting Quilts from Unusual Fabrics. I stopped at 2 local shops: The Quilting Bee (absolutely irresistible) and Cozy Quilt (fresh & bright). I taught 2 full-day workshops at the guild, and demo’d my Simplified Double Wedding Ring on student Becky’s 1915 hand-crank Singer machine nicknamed Tiffany. What a hoot! Becky took a photo of me sewing with trepidation. 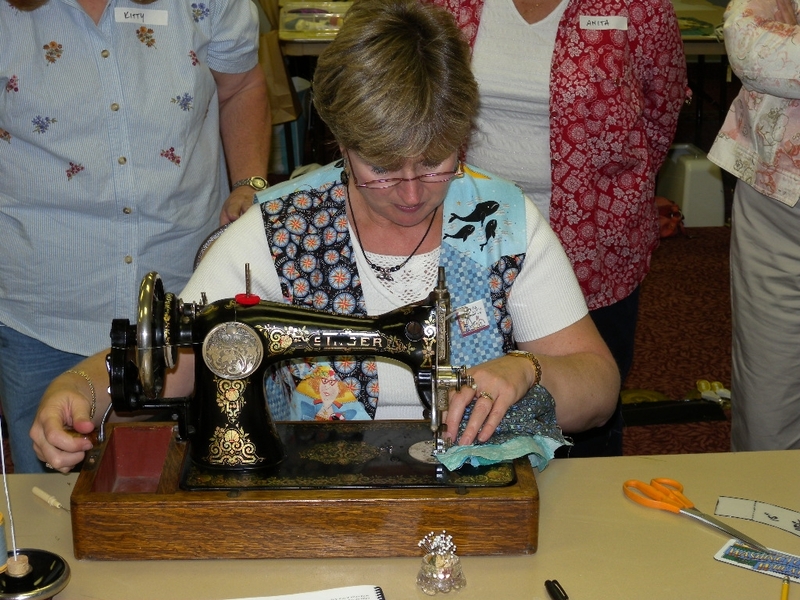 The ladies were all great, and I had a wonderful time sharing my passion for quilting. I have several photos that I want to share with you. Back cover of Linda Causee's book "100 Any-Size Applique Blocks"
Fellow quilting “bud” Linda Causee has a new book called “100 Any Size Applique Blocks” published by Leisure Arts. It contains a CD so that you can make any of the blocks whatever size your heart desires! 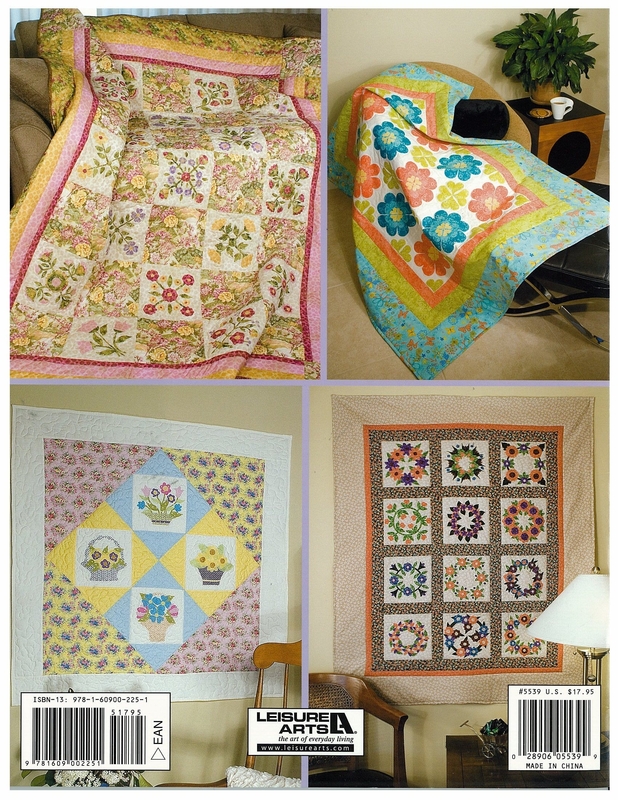 I was really impressed with the back cover – as all 4 quilts shown are made with Northcott fabrics. 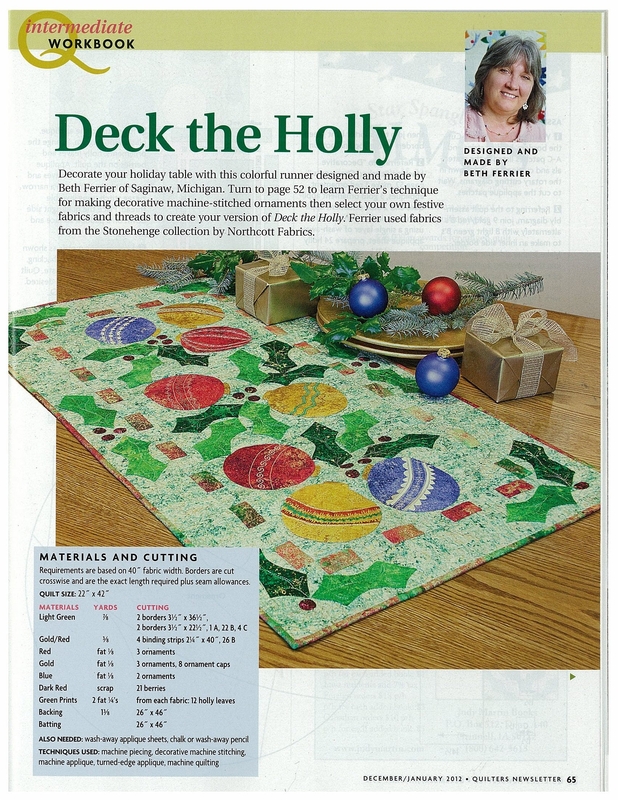 that my Hawaiian Punch quilt was featured in Quilter’s Newsletter’s Best Fat Quarter Quilts, on newsstands now. Well, when I read my issue, I saw that fellow quilting “bud” Beth Ferrier of Applewood Farm does as well. Isn’t it delightful? Beth is the goddess of easy applique, and has several books to teach you how to be one too (visit www.applewood farmquilts.com). Even better, her quilt is made with Northcott’s Freckles textures. December/ January issue of Quilter’s Newsletter AND it is made with Stonehenge Celestial/ Celebration. I think I shall put this on my to-do list for next year, using the new Stonehenge White Christmas. Divine!! 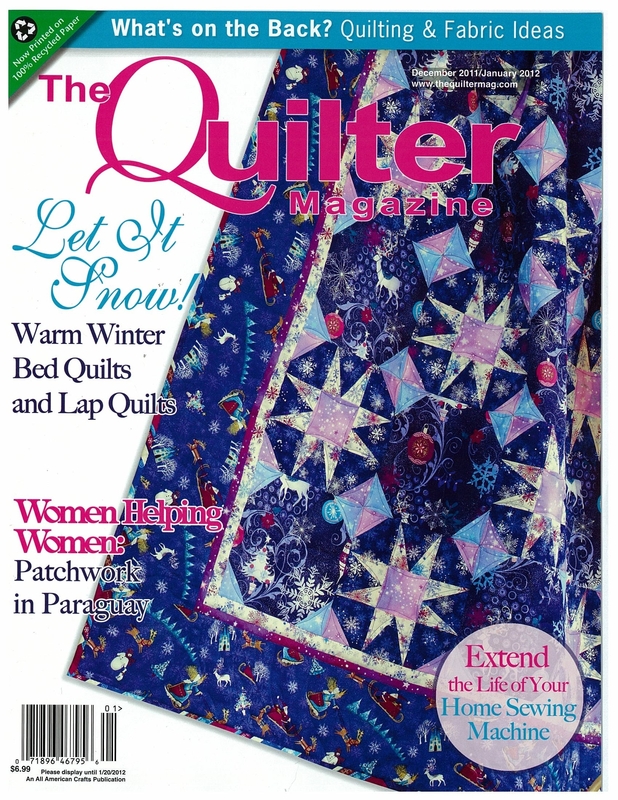 and I were elated to see our Frosted Stars quilt featured on the cover, no less, of the January issue of The Quilter magazine. I just loved this deep violet colourway of Snow Queen right from the get-go. Snow Queen is more winter than Christmas, so you can enjoy a quilt made with it long after New Years. 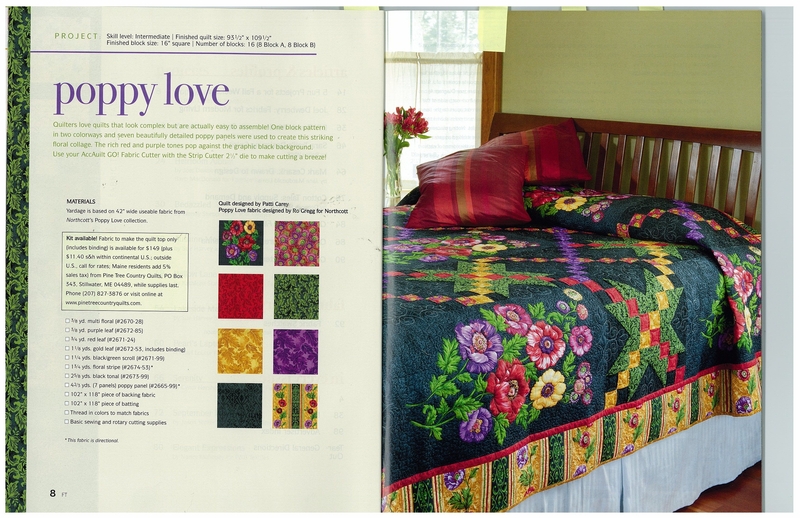 We also have a quilt featured in the Winter 2011 issue of Fons & Porter’s Easy Quilts. I really like this one – the Wonders of Winter fabric collection includes a lengthwise border stripe, and I used it in the Card Trick blocks. I will definitely include this one in my future trunk shows. Kits are available for a limited time from www.shopfons andporter.com. In my last post, I mentioned that Northcott was doing a Block-of-the-Month program featuring Stonehenge fabrics. 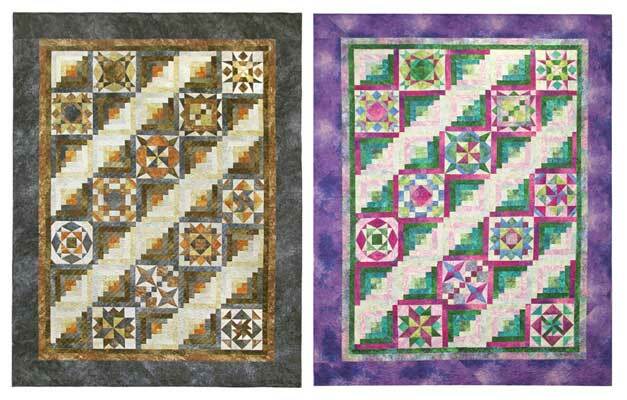 I contacted Susan Meyer of Susie Q Quilting in Eureka, MO, who used a tried-and-tested pattern by Marti Michell for the stunning Stonehenge Meets Jamestown sampler quilt. It is available in 2 gorgeous colour combinations: Colorado neutral, and Jeweltone bright. My personal favourite is the bright one. Our shops have been asking us for a Stonehenge BOM program for quite some time, and we were so pleased that Marti Michell agreed to partner with us. Her BOM programs are so well-designed and well-written, they are virtually fool-proof. Northcott is suggesting a start date of April 2012 for this program, and shops will have samples and sign-up lists up shortly. We are sew excited about this! At lunch today, I helped fellow staffer Lisa make her very first batch of tart pastry for butter tarts that she is making for her boyfriend’s birthday. She is taking the pastry-filled muffin tins home to bake the tarts tonight, and says that she will bring in the leftovers for us. Ha! I have never seen butter tart leftovers! 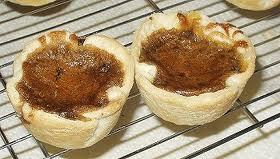 Here is my mom’s recipe for Butter Tarts. Combine 1/2 cup soft butter, 1 cup dark brown sugar, 1 cup golden corn syrup, 1 tsp vanilla, 2 eggs and 1/2 tsp cinnamon. Place a dozen raisins (Thompson are best) in each of 24 unbaked tart shells. Pour filling into each shell, filling 3/4 full. Bake at 375degrees for 20-25 minutes. Immediately run paring knife around edge of each tart while still warm. Let cool completely before removing from pan. Makes 24 tarts. For pecan tarts, substitute chopped pecans for the raisins. This reminds me that I need to bake my Christmas fruit cakes this week, and think about which cookies and squares to add to the list of goodies that I make each December for family and friends. I know, you’re thinking “Who actually eats fruitcake?”, but my sons, aged 19 & 17, actually ask for it – it’s that good. It wouldn’t be Christmas in my house without countless trays of goodies. Do you have a favourite holiday cookie or square recipe? Please share it by November 30, and I’ll randomly draw a winner for a pack of holiday fabrics.